In 1570AD, the times of peace and prosperity were finally over. 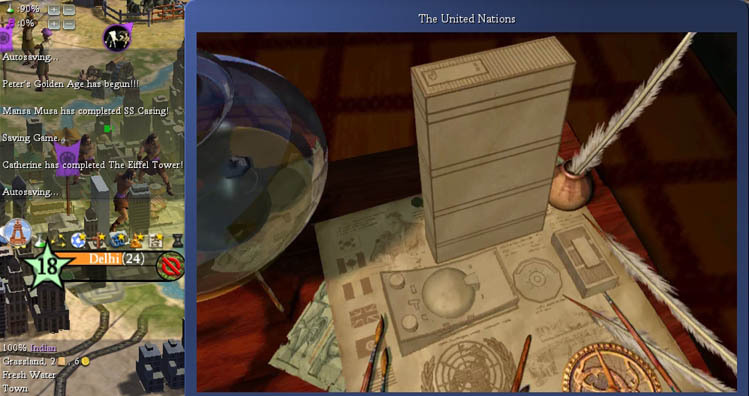 There should be not a single game of CIV with no wars! Finally, Peter got restless enough to declare war. On...Mansa Musa! Yes!!! The downside of this of course was that I collected some -1 penalties with the AIs for not helping them out in their wars. Er...now what did they expect from me, really? Should my missionaries scare their units to death? Should my fast workers run around them in circles until they become dizzy and got lost? Anyway, my relations with them still remained very good. In 1635AD, I adopted emancipation and representation and finally got some happiness for my cities to grow. Peace broke out again between 1710AD and 1735AD, and again I was scared I could be the next target...here's another shot of my empire from around that time. I was like 10 techs behind now, but the beeline to Mass Media for the U.N. was not the same as the path to the space ship the AIs usually take, so I was able to trade my way back to near tech parity again. I guess it helps if you're second last in score and on friendly terms with half the world to avoid that dreaded "We Fear You Are Becoming Too Advanced!" message. In 1790AD, I discovered Mass Media (and started on Biology next, to grow my population for the election). 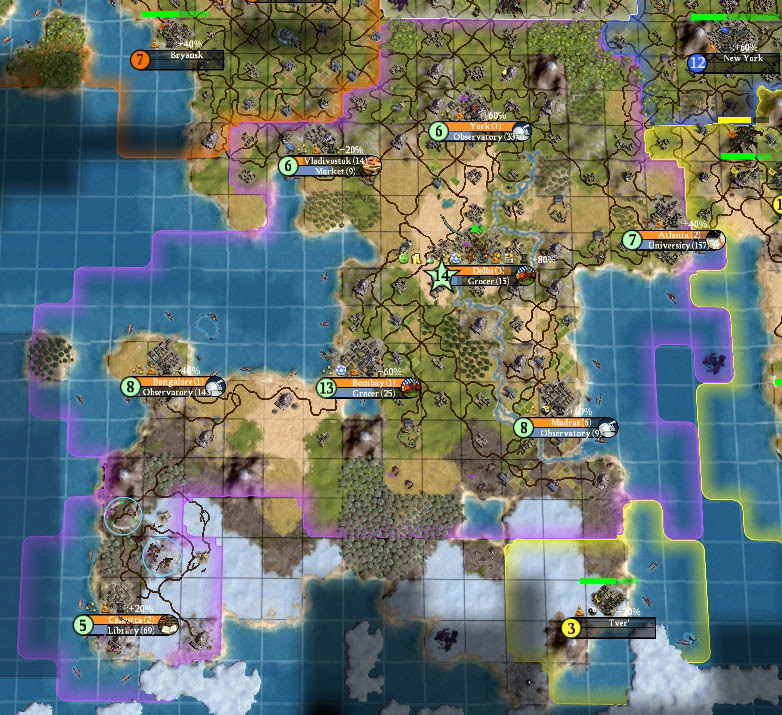 My overall research goal was reached, and so I mercilessly replaced the towns at Delhi with watermills to build the U.N. faster, and completed it in 1830AD - only my third wonder after Stonehenge and the Oracle! 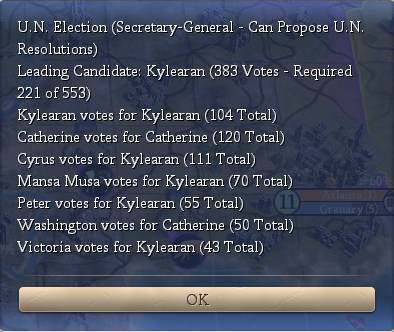 The only downside was that Washington was down to cautious now because I had signed defense pacts with his rivals. 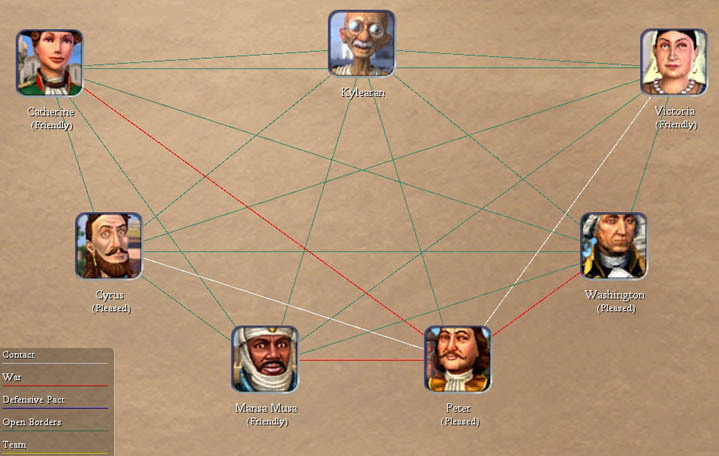 But 4 friendly and 1 pleased civ? How much better can it get? Election to become U.N. secretary general went smoothly. 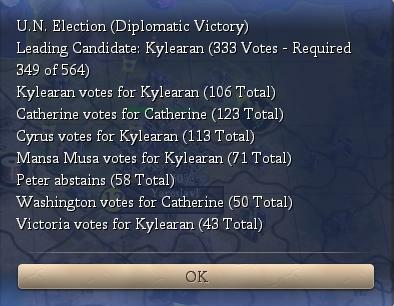 Only Washington voted for Catherine, I can live with that. So I waited a few turns, relieved to see that still nobody attacked me, and looked forward to my diplo win on a no-military game! I took a look at my relations to Peter, and saw that I did not yet have a "paid tribute/helped me" bonus with him. So I set research to techs he didn't have, like refrigeration, hoping he would ask for them. Now would this extra relationship bonus with him tip the scales? Yes!!! Victory, sweet sweet victory! I made it! 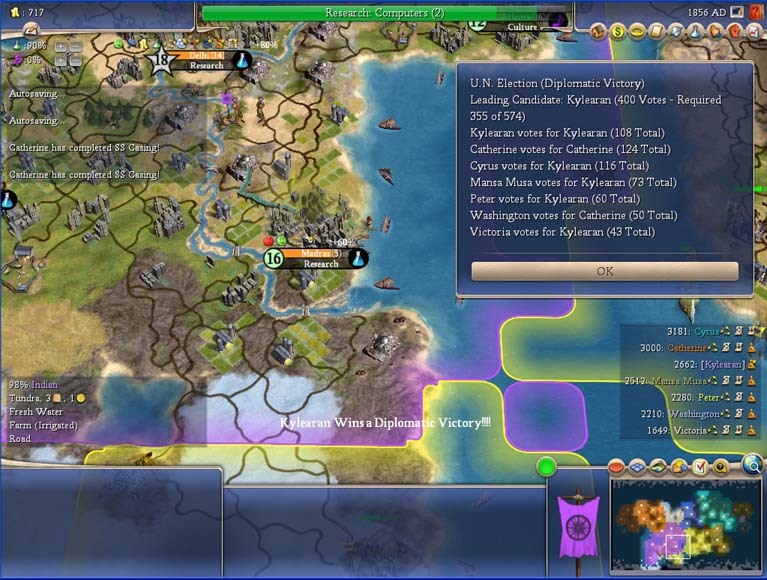 I've won a game without building any military units! 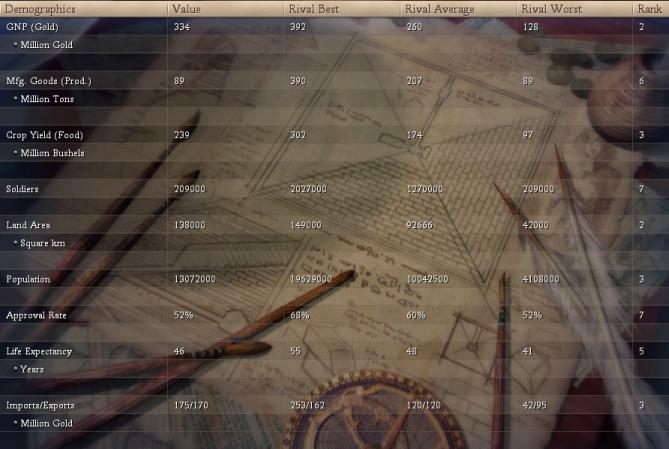 Although I had done no fighting in this game, it had been really exciting for me. I always felt I was on the brink of doom, not knowing if my huge efforts towards diplomacy like spreading religion, trading away my only resources, giving in to demands etc. would turn out to be enough. 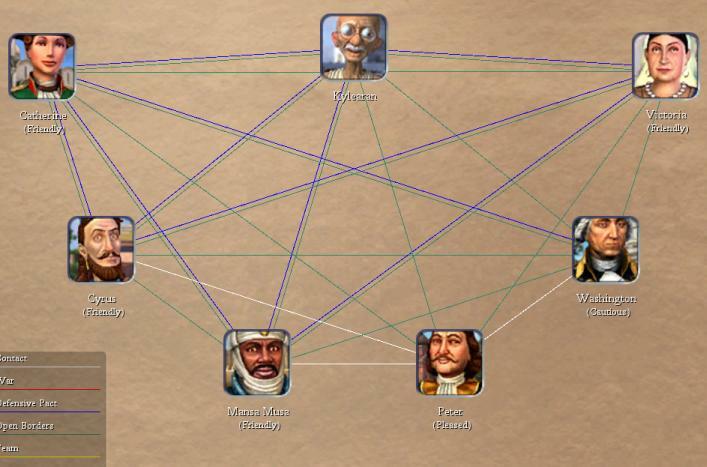 But as it looks like, stable relationships can be made with the AIs - at least with those I had to face in this game. All my unusual moves at the beginning of the game had cost me a lot in terms of production, land size etc... What I'm wondering about though was why the "Soldiers" value was still so high? 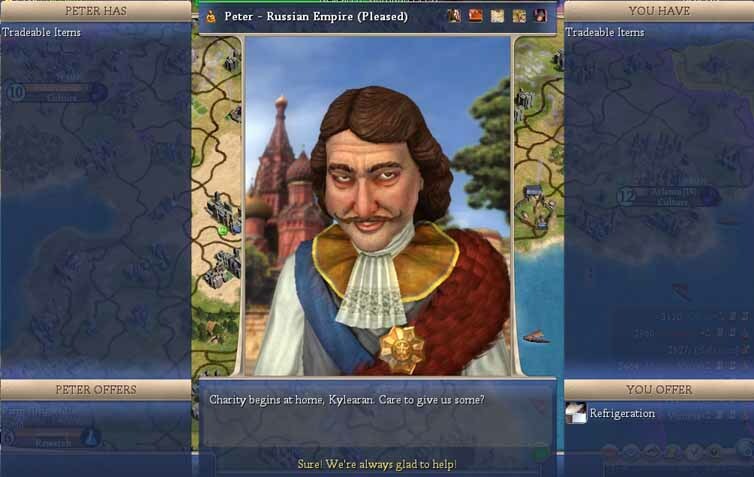 Maybe workers and/or missionaries count there as well, as they did in Civ 3? I will revisit this concept sooner or later with some neurotic and aggressive AIs in the game, and then I'll try to fool them by having LOTS of workers sitting around. Maybe that works, who knows?